A couple of months ago, we interviewed The Wooden Birds (we did!) and there was mention of a new album by Leslie Sisson and her harmonious voice. Some time later, Harmony was released and we’ll concentrate in its pop rock loveliness. Two sunshiney, flowery tracks welcome you with open arms (as wide as the ocean, as truthful as a sunset by the harbour). ‘Waiting’ is the rockier one, change is the soothing one, catching a good current of alt-country and riding it all the way to the warm sands of the beach. Now, it’s the little moments where the music soars and creates images both of nostalgia and wishing for a better tomorrow where Harmony really shines. 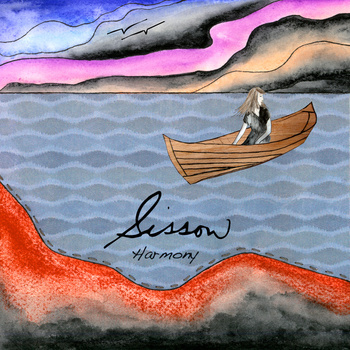 ‘Harmony’ is the very first of these moments, an adorable ditty with amazing imagery thrown at you. Memories of being driven around by your parents by the coast; holidays that will never happen again. At the same time, the contrasting emotion is that those good times are gone, but there’s the possibility of now you driving along the coast with family on tow. A tender optimism that also flies around in tracks like ‘Other’ (easy going, catchy) and the superb ‘Blues’, which makes you think about that blue stranger and why is he an angel (beautiful track). Now, for all the slightly poppy tracks, there are moments when the mood is more the product of grey-coloured brushstrokes instead of sunny cans of spray. ‘Pass’ is very, very melancholic, a stark reminder about the low points that exist in this path called life. ‘Win’ is slightly cheerier musically, but it feels emotionally gloomier. Both very intimate tracks and can’t stop thinking of those nights after all-day family reunions, where the moods are a little more down, but people still smile because they are with their families. Harmony is a collection of tracks that are reasonably happy on the surface, but a couple of riptides are there, waiting for the unsuspecting. Gotta give some kudos to Ms. Sisson‘s voice, it’s the instrument that jumps out and grabs your attention. A hard task when surrounded and enveloped with such beautiful tones. Leslie Sisson Website. Facebook. Soundcloud. Twitter. Bandcamp. Myspace. Posted in Alt country, Americana, Folk, reviewsTagged Beautiful, Harmony, Leslie Sisson, peaceful, slightly retro, sunshineyBookmark the permalink.